Gambling in Norway is more restricted than in any other first world country although there are signs that this is gradually changing. Norway's position as an oil rich nation has allowed its government to ignore the temptation to regulate legal gambling for tax revenue purposes. Its position as a member of the European Economic Area, rather than a member of the European Union, allowed it to win a surprise ruling by the European Free Trade Association in 2007 to permit a state monopoly on gambling. Two state companies exist. Norsk Tipping runs games of chance like the Lotto, online casino games and a small amount of sports betting. Norsk Rikstoto runs the equivalent of the Tote, parimutual betting on horse racing. There are no legal casinos in Norway. Even cruise ships in Norways' territorial waters (12 nuatical miles from the coast line) do not have functioning casinos. The good news is that the Norwegian government has not banned gambling online so you have plenty of choice if you are looking for a casino online that has multiple langauge and currency options including Norwegian. Sports betting is moderately popular but no where near the scale it is in the UK and less than it is in neighbouring Sweden. 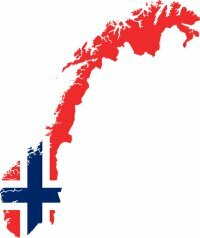 The state run operator's website has limited sports betting options but all major international bookmakers have Norwegian sections of their websites. Horse Racing is restricted to 12 tracks. There are 11 harness racing tracks and one track, Øvrevoll Galoppbane, which is regular horse racing which has a turf and all weather surface and is about 10km from central Oslo. Norsk Rikstoto operates the parimutual betting shops in the 12 racetracks in Norway with the governemnt taking 3.7 of the turnover as a taxation. They also offer a range of V bets which are V4, V5, V64, V65, V75 and V86. These are all versions of a jackpot similar to the UK's Tote jackpot. V4 is just a four legged jackpot with multiple picks if you wish. V75 is a tote jackpot but you get consolation prizes if you get 5 or 6 correct. The minimum bet per line is 0.06 Euros. The pools are joined with those in Sweden so as to build a bigger jackpot. Prizes have reached over NoK 100 million. These gambling outlets do not exist as they do elsewhere like Sweden. Slot machines were banned in 2007 but were replaced by IVTs (Interactive Video Terminals) two years later. These can only be played by players in posssesion of a players card with which the state controls the limit of spend. Norwegian citizens take to poker easily. Until very recently this too was banned in Norway. But a recommendation in 2004 by the country's Ministry of Culture prompted a change in the gambling law. So in 2015 the first ever Norwegian Poker Championship was held in Oslo. Previous tournaments with the same name were held in Ireland, England, Latvia, and Sweden. Oslo-born Felix Stephensen won the event where 1,973 players paid 5,000 NoK to enter. Viking Lotto is a cooperation between the national lotteries in Norway, Sweden, Denmark, Iceland, Finland, Latvia, Lithuania and Estonia. Viking Lotto started in 1993 and was the first of its kind in Europe. Norsk Tipping Lotto is a lottery run by the Norwegian state since 1986 and is drawn once per week. Its a 34 number game where the jackpot needs 7 out of 7 correct numbers to win or 1 in 5,379,616. There are no set prizes but it varies on the pool size and how many winners of each section there are. The five different prizes are match 7, match 6+1, match 6, match 5 and the bottom is match 4+1. The highest jackpot so far is Nok 25 million. The Oksnes family are famous in Norway for having three different members win the jackpot over a period of six years from 2006 to 2012. They won 12.2, 8.2 million and 8.4 million Kroner.